Complete Disclosure: This post is written based on a complimentary newly published book for review. These Macau Vanilla Custard Tart are wonderful treats for tea time. The aroma of vanilla perfumed the whole kitchen when these were baked in the oven. This recipe is from a new culinary and traveloque book by Mary Kate Tate and Nate Tate called Feeding the Dragon. We get a lot of newly published books for review offer but I normally decline the offer. But this book caught my eye because it’s a traveloque through China. I’m looking forward to visit Ben in Beijing and I would love to learn more about Beijing through the eyes of Mary Kate Tate and Nate Tate. You can check out Mary Kate Tate & Nate Tate travelogue via their blog Feeding the Dragon. 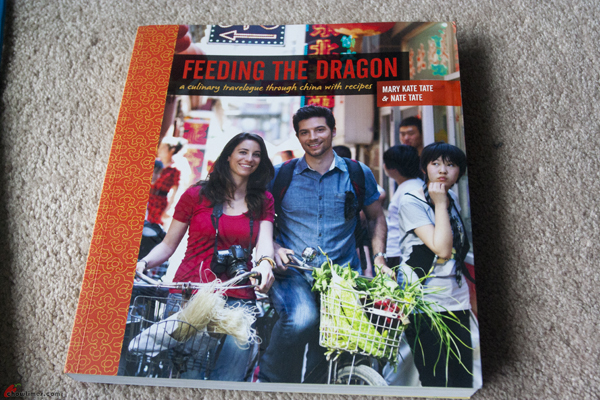 Feeding the Dragon is part cookbook and part cultural travelogue. It is arranged by the author’s travel itinerary starting from Beijing, the capital city and then running down China’s east coast, looping through the southern jungles of Yunnan Province, over the Tibetan Plateau in the west, through the Taklimakan Desert in the north near Afghanistan, and then back to the capital. 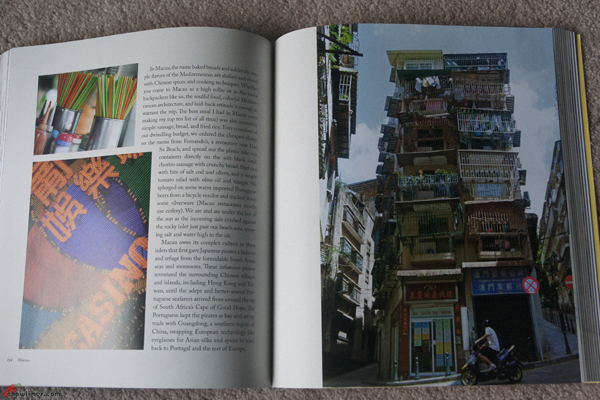 The book is filled with photos of their travel. 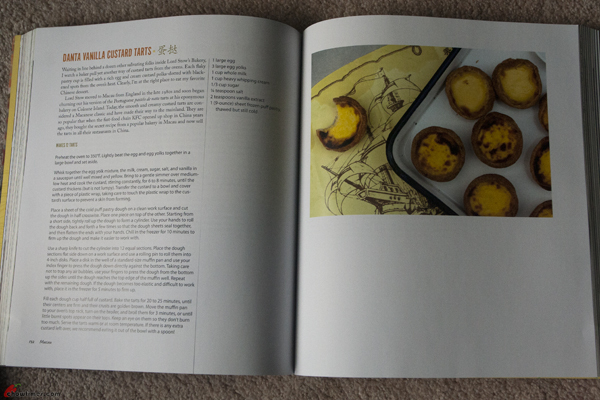 Feeding the Dragon features 100 recipes from the various regions from Buddhist vegetarian dishes to lamb kebabs to Macau’s famous egg custard tart. I love sweet treat and this is the first recipe that I tried from this book. Lightly beat the egg and egg yolks together in a large bowl. Whisk together the egg yolk mixture, the half & half, cream, sugar, salt and vanilla in a saucepan until well mixed. 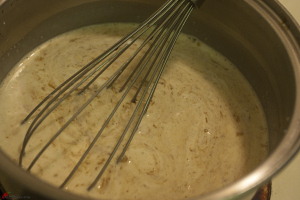 Bring to a gentle simmer over medium-low heat and cook the custard, stirring constantly, for 6 to 8 minutes, until custard thickens but not lumpy. Transfer the custard to a bowl and cover with a piece of plastic wrap, taking care to touch the plastic wrap to the custard’s surface to prevent a skin from forming. 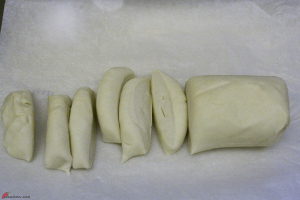 Place a sheet of the cold puff pastry dough on a clean work surface and cut the dough in half crosswise. 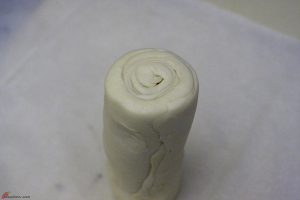 Starting from a short side, tightly roll up the dough to form a cylinder. 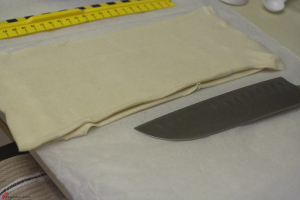 Use your hands to roll the dough back and forth a few times so that the dough sheets seal together. Flatten the ends with your hands or lightly tap the ends against a flat surface. 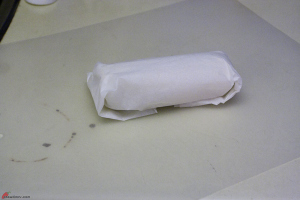 Wrap the roll using the paper wrap that comes with the puff pastry and chill in the freezer for 10 minutes or longer to firm up the dough to make it easier to work with. Use a sharp knife to cut the cylinder into 12 equal sections. 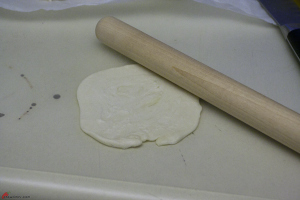 Place the dough sections flat side down on a work surface and use a rolling pin to roll them into 4-inch disks. 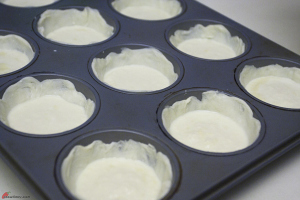 Place a disk in the well of a standard-size muffin pan. Use the rolling pin (or your index finger if you do not keep long finger nails) to press the dough down directly against the bottom, taking care not to trap any air bubbles. 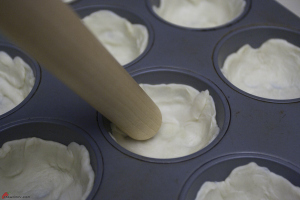 Use your fingers to press the dough from the bottom up the sides until the dough reaches the top edge of the muffin well. Repeat with the remaining dough. If the dough becomes too elastic and difficult to work with, place it in the freezer for 5 minutes to firm up. Fill each dough cup half full of custard. Bake the tarts for 20 to 25 minutes, until their centers are firm and their crusts are golden brown. Move the muffin pan to your oven’s top rack, turn on the broiler, and broil them for 3 to 5 minutes, or until little burnt spots appear on their tops. Keep an eye on them so they don’t burn too much. oh Thank you, thank you, thank you. I’m heading to Fortuna on Friday to see if they have any….. I really am addicted to Piri Piri and Nando’s just isn’t the same as real home-cooked Piri Piri you find at small bakeries. And the only place I’ve found the egg tarts was at T & T….. pretty good I guess but I’ll happily try Yaohan….. this is exciting! Fortuna Bakery on Hastings in Burnaby has a nice Piri Piri Roasted chicken for $9.99. I have only tried a little of their baking it seems Okay. The bakery @ Yaohan on #3 Rd has decent Portuguese tarts-they sell out fast though. 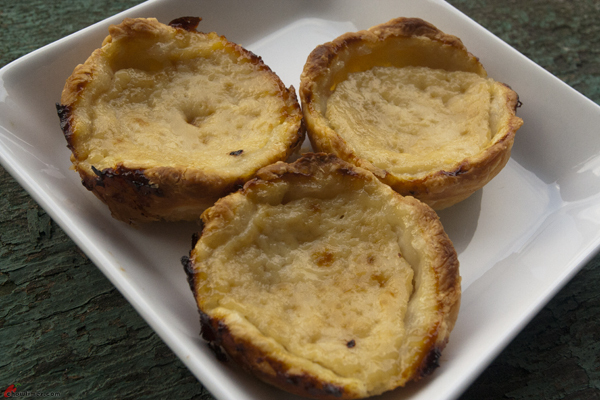 Yes, we lived in Little Portugal in Toronto and would buy these at the Portuguese bakeries…..mmmmm….. 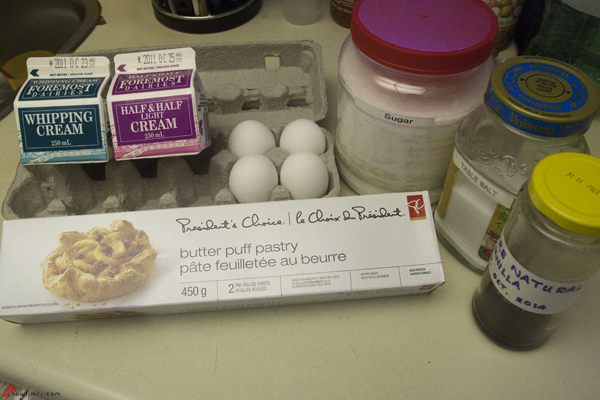 I miss these and the Piri Piri so much….. nothing in Vancouver compares…… I’m going to try baking these though to see if I can come even marginally close to those wonderful tarts. Thanks so much for posting this recipe. If you crave some Cantonese deli food in Beijing forget it not easy to find. I stay 3 months in Beijing decide to see it there anywhere selling some. The dim sum in one their tea house is ok but not really Cantonese tasting. Wonton not good at all no E mein anywhere. Since I rented an apt decide to make my own dishes and was happy at last.